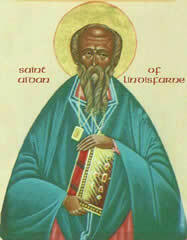 Saint Aidan of Lindisfarne, the Apostle of Northumbria (died 651), was the founder and first bishop of the monastery on the island of Lindisfarne in England. He brought the Christian ministry to England beginning with Northumbria. England was originally Christianized by the Romans but following the fall of the Roman administration it quickly became pagan again. Meanwhile in Ireland, Christian monks from Egypt and Ethiopia, were busy establishing the basis of Irish monasticism, a direct export from the deserts of Egypt to the gusty land of Ireland. Any one who needs further information in this area can research on the Internet, “the origins of Irish Monasticism”. Aidan was actually a Black Irish man. Even though the so-called white Irish of today would have you believe that Ireland has always been pale white, facts and history tell us otherwise. In the annals of the Kings of Ireland, in the museums of Ireland, in the Churches of Ireland, there is preserved a living history of the dark brown race of Africans who first populated Ireland. Their history, their culture, their music, their impact remain alive in today’s Irish culture. For instance, the bag-pipe of Ireland, and its music comes from the traditions of the ancient Nomadic Black tribes of North Africa otherwise called the Moors in ancient times. Certain aspects of the Gaelic language of Ireland recalls its African roots. Certain parts of Ireland, even today still appear unusually dark, testifying to the genetic footprints of their ancestors. The family names Moore, Marrow, are big in Ireland. Aidan was one of those Black Moorish Irish. His paintings so testify. After the wars of the reformation and the counter reformations, with the emergence of protestantism, the movement under which the so-called whites of Europe became prominent and dominant for the first time, many images of the ancient black saints were overlaid and re-painted white. Yet despite all of those strange politics, many early 5th century A.D. Christian leaders and monks in Lindisfarne area of England, and in Iona monastery of Ireland were black people. Their depictions, descriptions and stories provide further corroboration. Aidan was possibly born in Connacht. He was a monk at the monastery on the Island of Iona in Scotland. Aidan arrived in England from the Iona monsatry in Ireland as a result of a request by the then King of England Oswald for Chritian missionaries to convert the pagan English tribes to the ways of Christianity. He arrived England in 635 AD. Aidan chose Lindisfarne, like Iona an island, and close to the royal fortress of Bamburgh, as his seat of his diocese. From this seat of operation, Aidan and his monks slowly engaged the locals, and converted them to Christianity and the acceptance of the power of the English throne. Also with an eye to the future, Aidan took in twelve English boys and trained them at the monastery, to ensure that the area’s future religious leadership would be English. Aidan was also a magic worker or a miracle worker depending on your perspective. Once must remember that one of the ways the priests and the monks subdued the less civilized tribes was through psychological inducements leveraged by the manifest or faked power of their deities. Aidan was a known miracle worker and stories about him lingered for many years after his passing. Even Saint Bede the Venerable would later write Aidan’s biography and describe the miracles attributed to him. For instance, in 651 a pagan army attacked Bamburgh and attempted to set its walls ablaze. According to legend, Aidan prayed for the city, after which the winds turned and blew the smoke and fire toward the enemy, repulsing them. He reportedly healed the sick and tended the wounded. He made potent potions against poisons and venoms; and had strong talisman which protected against demons and bad luck. According to sources, even though Aidan was a member of the Irish branch of Christianity instead of the Latin branch, but his work won him the priase and the respect of the then Roman Catholic leader, Pope Honorius I. The monastery he founded later grew other churches and other monasteries throughout the area. It also became a centre of learning and a storehouse of scholarly knowledge. Aidan died, on 31 August, in the 17th year of his episcopate. His feast day falls on the 31 August of every year. I am finding this information about the Black Irish very enlightening. I recently re-read Confessions of a Pagan Nun by Kate Horsley which included many references to St. Bridgit. I had no idea that the early people of Ireland were actually from Africa. Everyone was from Africa in the beginning.